The biggest and most sensible vehicle in the Prius line-up, the 2016 Toyota Prius v features an interior as hospitable as your living room -- in fact, it’s so inviting, you may never want the road trip to end. This year’s Prius v showcases SofTex-trimmed seats with power-ready lumbar support for the driver. It also offers rear seats that recline for sophisticated comfort, so climb in and get comfortable! All this in addition to its electric engine and eco-savvy fuel economy. The 2016 Prius v also features plenty of cargo space as well as smaller, integrated rear storage compartments to help hold undersized articles within grasp. Other luxuries include prominent trays cup holders; and loads of high-tech components to make this hybrid the perfect family refuge while on the road. 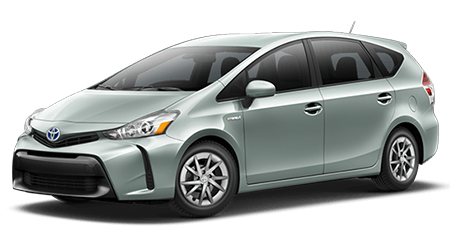 Take a peek at the Toyota Prius v and take it for a test drive here at Lipton Toyota in Fort Lauderdale, FL. Our passionate sales staff is standing by and ready to serve our neighbors in Dade County and Broward County, FL. Moving up to the level Three trim level, you’ll acquire Bluetooth connectivity, a 4.2-inch color information display in the gauge panel, a 6.1-inch navigation touchscreen that features voice and control climate, and audio controls on the steering wheel. The 2016 Prius v Four includes SofTex upholstery, auto-dimming rearview mirror, heated front seats, and an eight-way power driver's seat that features adjustable lumbar support. At the top of levels -- the Prius v Five -- adds LED headlamps, 17-inch alloy wheels, and fog lamps. More options are available -- both in bundles and sold separately. Be sure to check out the Advanced Technology Package, which packs together a panoramic sunroof with electric sunshades, a radar-based dynamic cruise control, and hard-disc-based navigation system. It also includes a lane-departure warning system, a pre-collision warning system, and automatic high beams. Toyota includes a complimentary year of the Safety Connect system, which provides drivers with roadside and emergency assistance, an automatic account of emergency services in the event of a collision, and stolen-vehicle location assist. The Prius v hatchback offers a convenient method to load your groceries or soccer gear. And the cargo area provides a copious 34.3 cubic feet of space for all kinds of things. With the rear seats folded there’s, even more, area – up to 67.3 cubic feet. Additionally, the front passenger seat and rear seats fold flat, making it easy to haul long items like long wood planks or ladders. And don’t worry about small stuff like a flashlight, gloves or even first aid kit -- 2016 Prius v retains many small-item storage sections throughout the cabin. The 2016 Toyota Prius v depends the continuously variable transmission (CVT) that’s matched with a 1.8-liter four-cylinder engine and an electric motor. Together they create 134 horsepower. Like other Prius versions, there are a variety of drive modes available – Eco, Power, and EV – and the standard hybrid. Eco assures fuel economy above the rated 42 miles-per-gallon combined (44 miles-per-gallon city; 40 miles-per-gallon highway). Power is planned for steep hills; and EV features all-electric drive, at low speeds to the threshold of the battery's energy capability. The 2016 Toyota Prius v features an environmentally-sound and family-friendly car. With the driver’s available 8-way adjustable seat that includes power lumbar support, you can also achieve customized comfort during your ride. Convenient technology like Push Button Start and the Smart Key System helps you initiate the fun right from the get-go. Even your passengers can relax with the Prius v’s reclining and sliding rear seats – they’ll feel like they’re travelling in first-class. The available Entune App Suite lets you call in last-minute dinner reservations via apps like OpenTable, and Pandora will keep the mood just the way you like it with your own playlist. You’ll get solid customer service and our incredible price when you purchase a handsome, Toyota Prius v at Lipton Toyota located at 1700 West Oakland Park Blvd. in Fort Lauderdale, FL. Be one of the first in Dade County or Broward County, FL to own this roomy and comfortable 2016 Toyota Prius v!